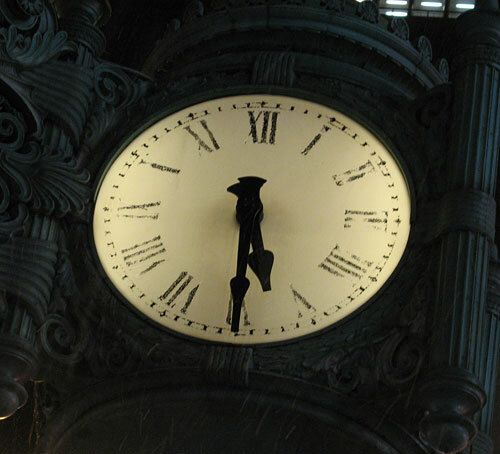 Another year, another time to mourn the loss of Marshall Field's. As tradition here at the State Street Showdown, we cannot award Macy's a 1st Place award by default, given that there are no other competitors. Also, because Macy's is the Spawn of Satan. 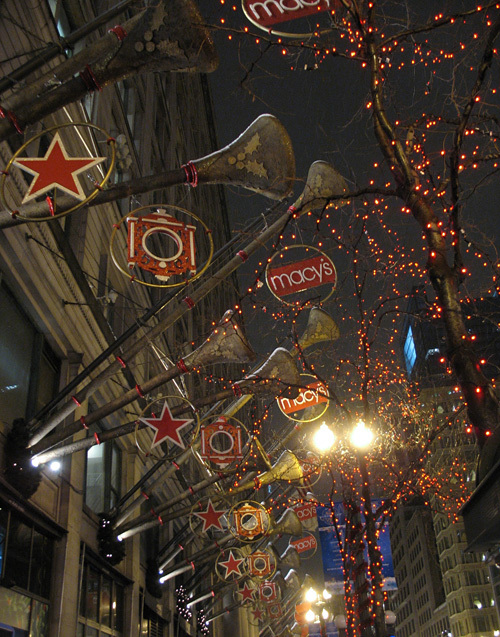 Back in November, the Chicago Sun-Times happily reprinted a Macy's press release, disguised as an article. Seriously, the thing reads like a commercial. 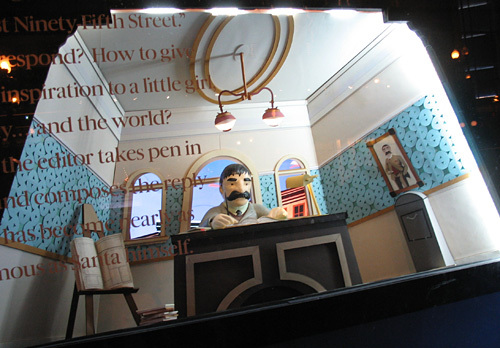 In any case, the 'article' noted the following: "Seven State Street window scenes — smaller than the usual holiday showings — tell the story of the famous 1897 New York Sun editorial inspired by an 8-year-old girl's letter to the editor that questioned the existence of Santa Claus." Let's back up a second, shall we? 7 windows? 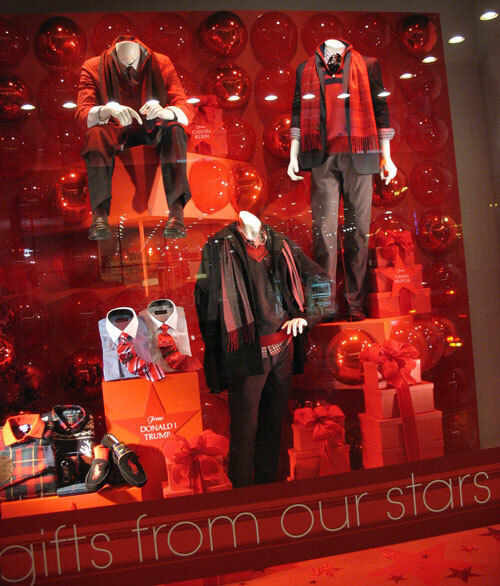 Wow, way to work really hard there, Macy's. 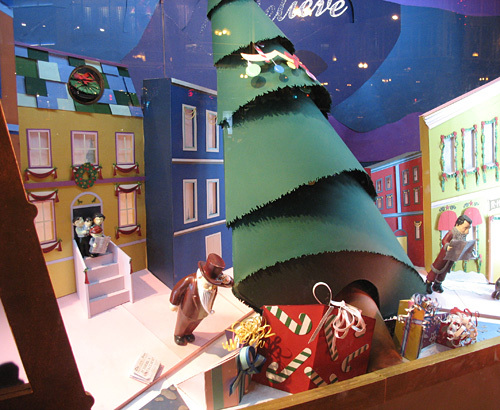 In 2009, Macy's State Street had 9 Christmas windows. 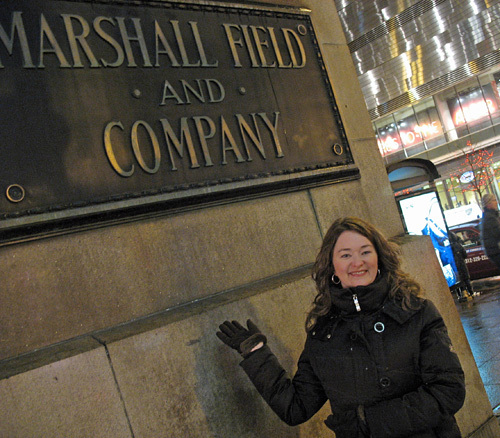 In the final year of the Marshall Field's brand — 2005 — they had 11 windows. Yup, this is a company set on maintaining quality and Chicago tradition! But that's just it… these windows weren't designed for Chicago. 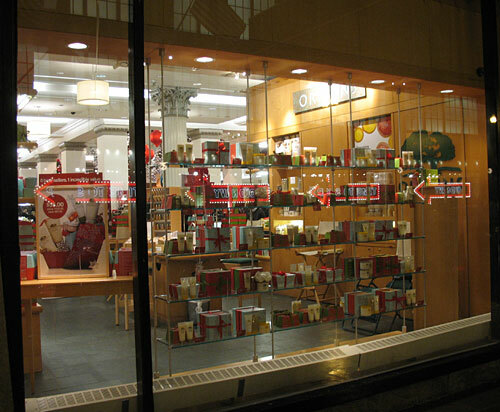 Rather, they were franchised to major Macy's stores around the country. The exact same thing with no modification in story or display. 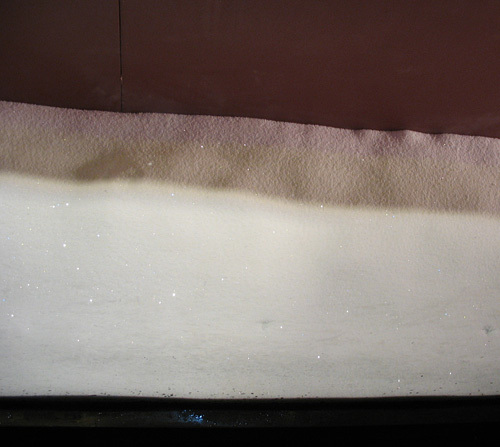 Take a look at the windows in Pittsburgh… yup, no difference. Talk about definitely not tailoring to your audience. 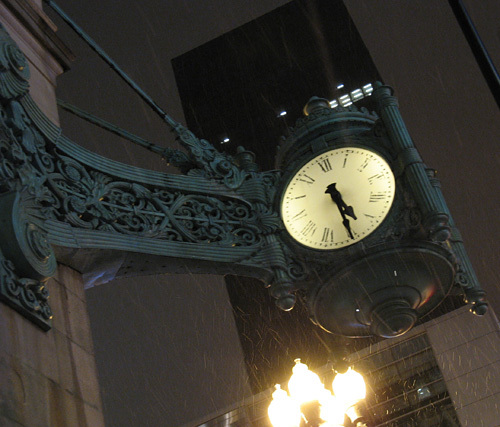 There are so many elements that go against what a Chicago holiday crowd expects. This window theme plays off (A) a story that takes place in New York City, (B) highlights the Macy's flagship name in New York City, (C) plays up the importance of newspapers, even as the Tribune company has filed the largest media bankruptcy in our country's history, and (D) there's a crass TV special tie-in to the window display. Oh look, a TV tie-in! 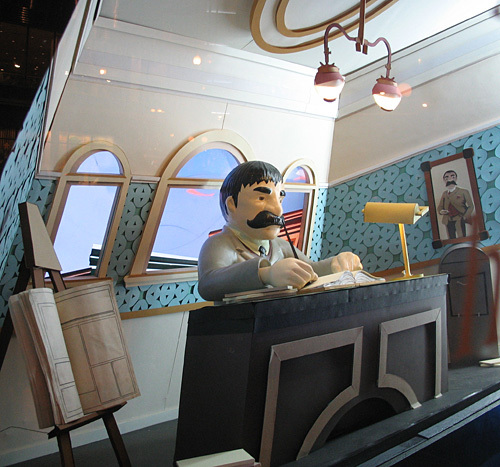 A big deal is also made about how these window designs are all hand-crafted paper scenes. 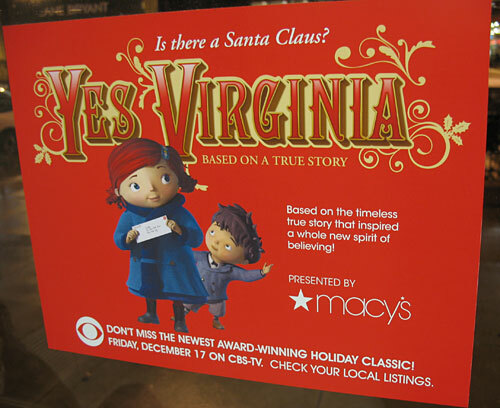 Macy's makes a big deal about pointing that out, both in public relations materials as well as an informational piece on the windows themselves. But guess what? 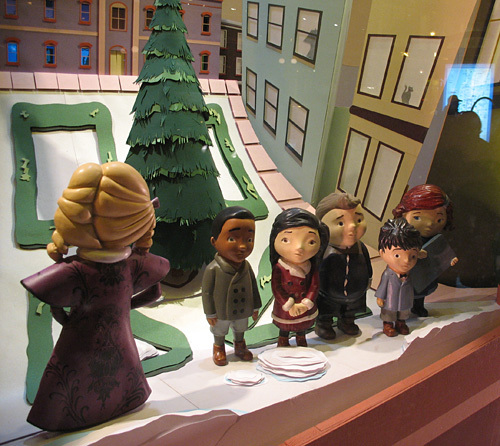 The actual characters used in the windows are not paper. 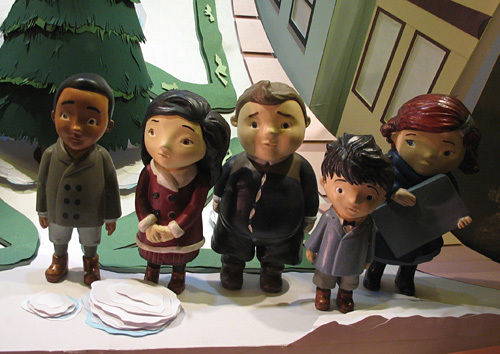 So, we're supposed to get excited that you basically used regular, fiberglass characters in scenes made of paper? I'm not sure what the "unique" element is there. Either go one way or the other. Going half-way sort of kills the appeal. 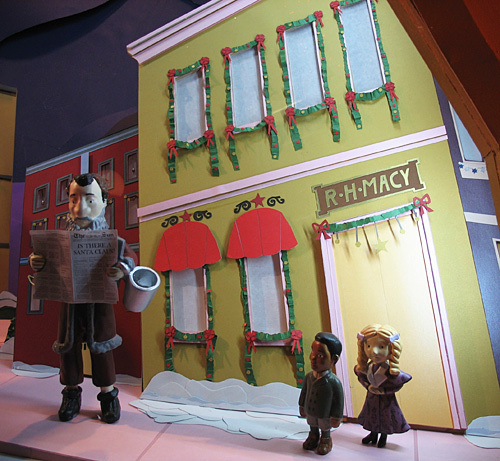 Macy's claims that it took more than 35 weeks for the State Street 2010 Christmas Windows to be created. I'm going to guess that number is inflated because they were mass producing the same scenes for stores around the country. Despite the letdowns, still an Amy & Steve tradition! 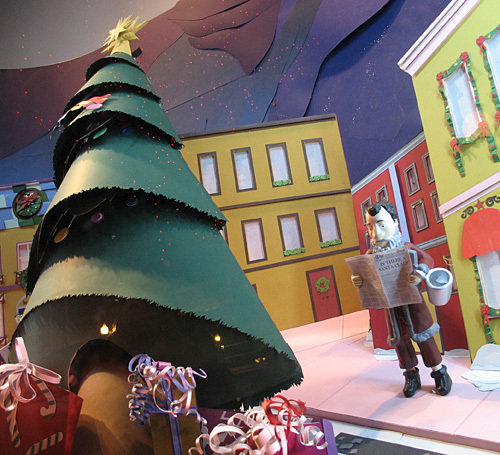 Before we dig into Macy's Christmas windows for this year, a couple more observations. 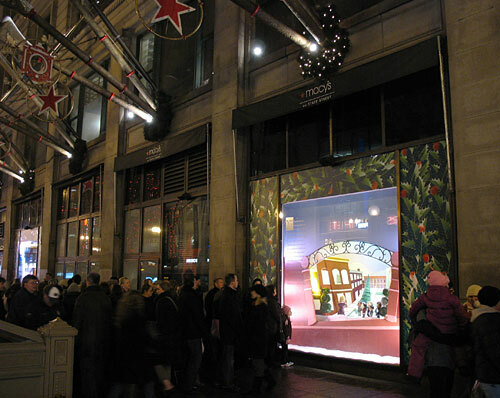 There are 9 possible windows that can be used on State Street; Macy's used 7 of them this year. 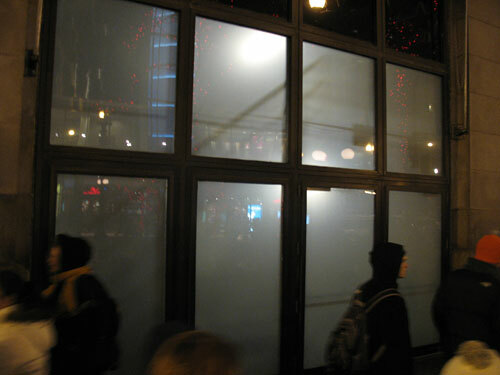 3 more windows can be found on Randolph St.; Macy's didn't use any of those for their story. Finally, there are 2 windows on Washington St.; again, none were used for the story. 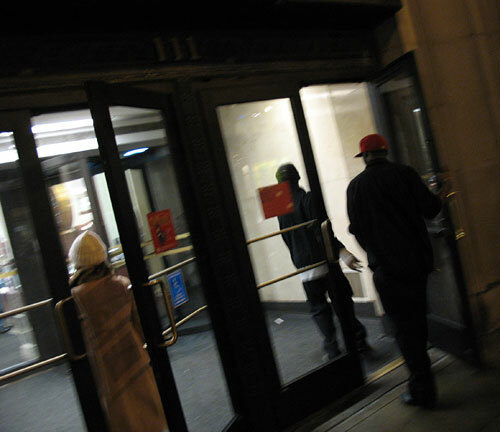 There are also 4 doorways on State Street that have been closed from public access for some time. 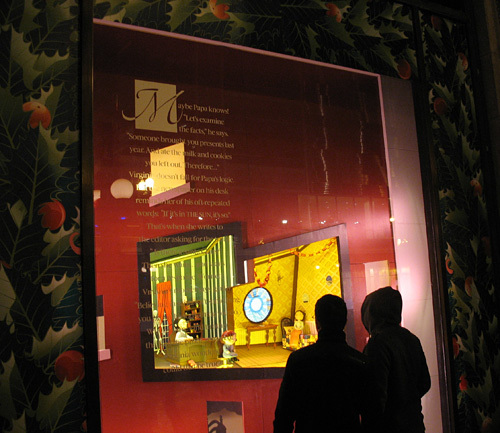 Historically, Marshall Field's placed theme-appropriate signage on these doors, often explaining the Christmas windows theme, promoting the Walnut Room tree, or other activities that the store was hosting over the holidays (see an example from 2004). 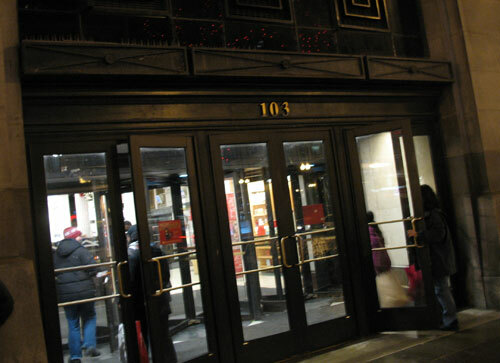 For the 2nd year in a row, Macy's did nothing with these doorways, rather leaving them a generic white color. 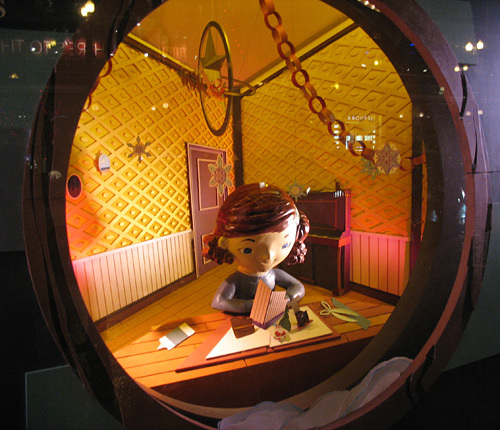 I know I rant about Macy's quite a bit, but since they've taken over the State Street store, there has been a continual decline in quality and effort when it comes to the holiday windows. 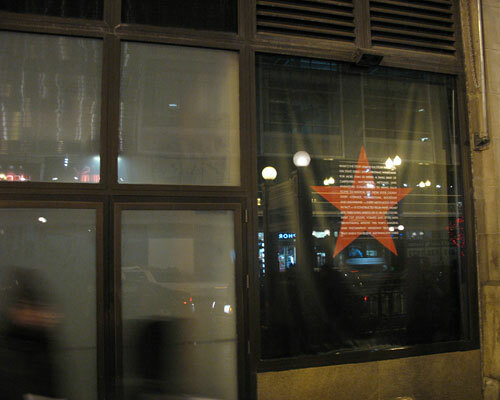 In 2008, they fired the team that had designed the windows on State Street for 25 years. It's obvious. 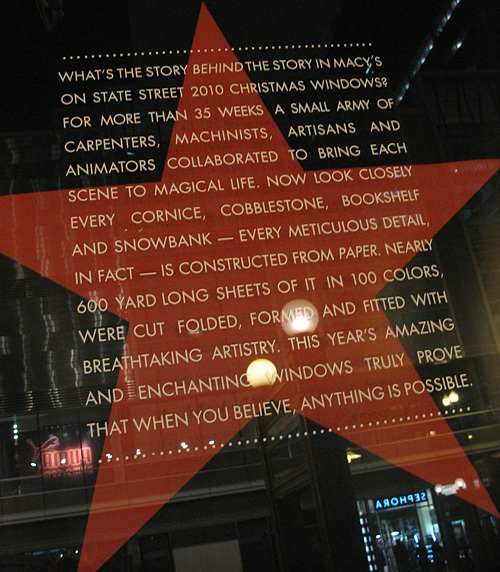 Simple concepts like printing text on windows that is legible and visible seems to elude the team on State Street. You'll see some photos posted below that just make you scratch your head, wondering "why didn't this problem occur to anyone?" You'll also see less actual window space used vs. previous years. Again, this is an example of cookiecutter concepts being pushed out to all Macy's stores, not factoring in local details or attributes. 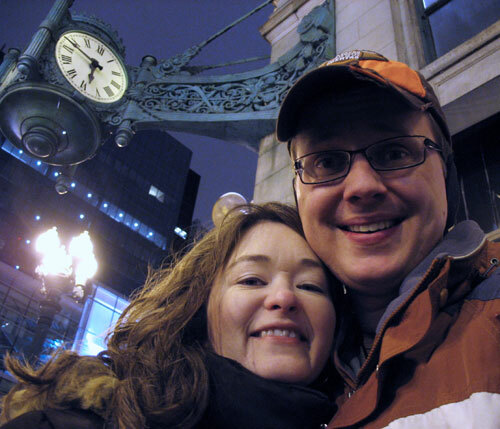 Doing a quality job, handling usability problems, being kid-friendly, and having a Chicago focus isn't an impossible task on a budget. 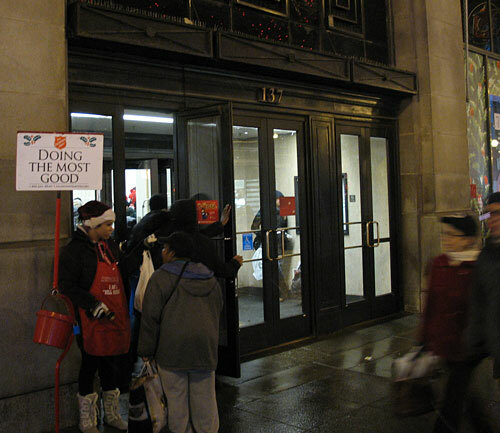 Sears successfully pulled off excellent examples of this in 2003 and 2004. 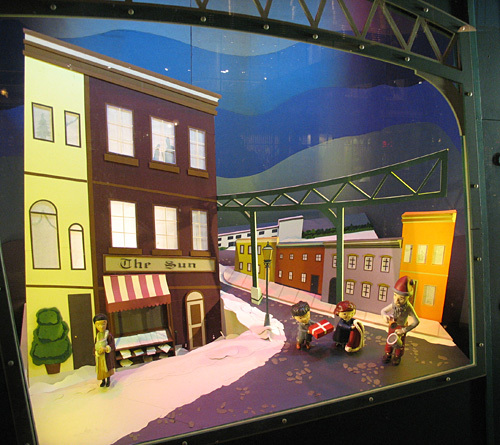 We start out on Randolph Street with no windows related at all to the Christmas story typically found on State Street. It's just merchandise! 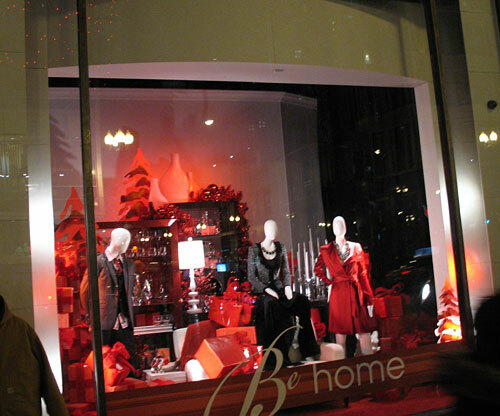 Before you round the corner from Randolph Street to State Street, take a look at our red stuff! 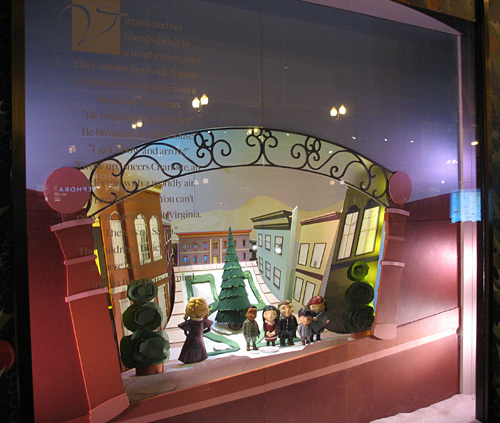 Shockingly, we start out on State Street and the first window isn't even part of the holiday window "story". Wow, that's just cheap! Story still hasn't started yet, but hey, it's a doorway, so you might as well do some good. Drop something in the kettle! Yeah! 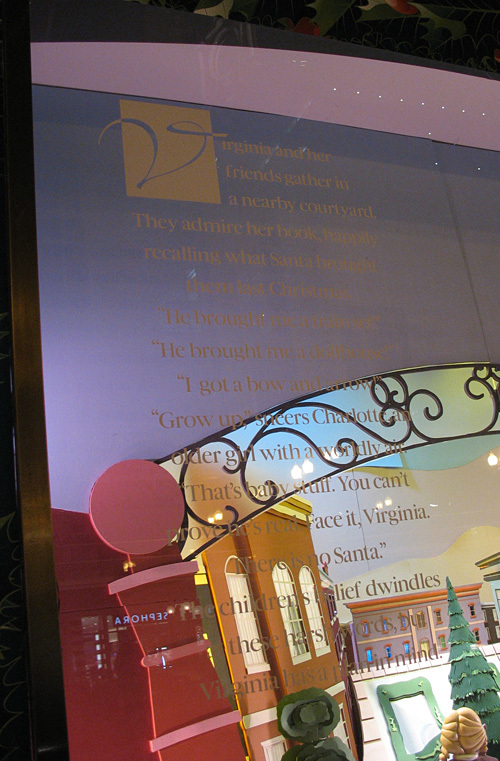 We finally start the "Yes, Virginia" story with our first themed window. Note how the artwork really only takes up a very small part of the window real estate. 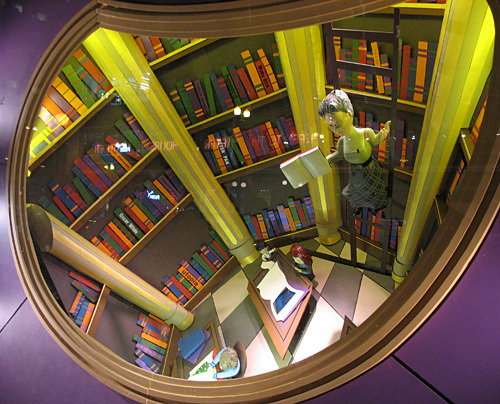 It's like looking through a porthole. 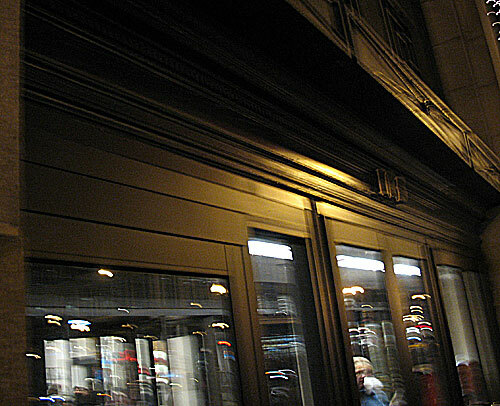 Closed doorway on State Street. Love the white nothing! 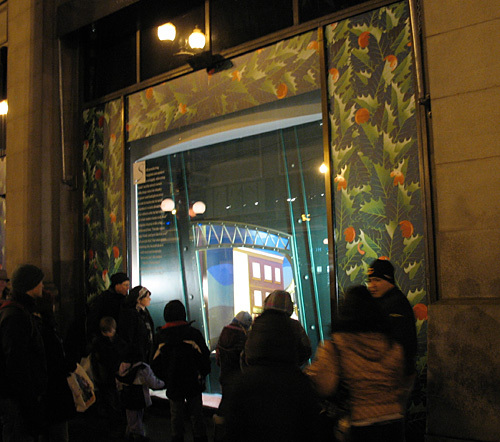 The first of the closed doorways, previously home to store information, holiday events, Walnut Room promotion, and text relating to the State Street windows. Now it's just a wall of white, home to the homeless. Another closed doorway. 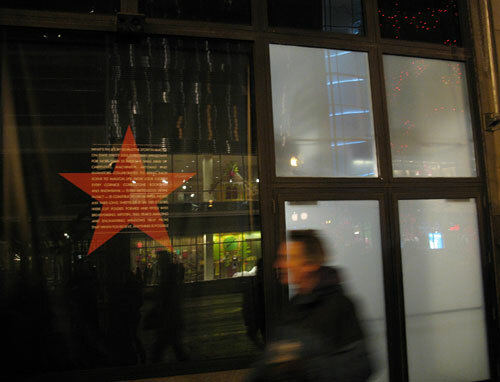 The white is made even more dramatic by the black/red star window with the story about the windows (which we featured earlier in this post). Would it have been that difficult to at least make the other doorways black to match? "He brought me a train set!" "He brought me a dollhouse!" "I got a bow and arrow!" older girl with a worldly air. prove he's real. Face it, Virginia. Virginia has a plan in mind. Buildings are paper, the people... not so much. Purple girl moves left to right on a track. Nothing but happiness in this scene! 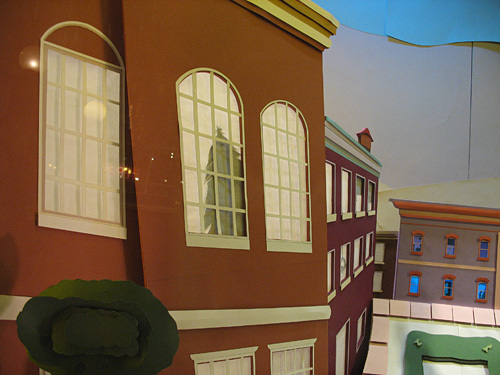 This window showcases some of the paper construction techniques used in the 2010 windows, contrasted by the characters which were obviously made out of other materials. 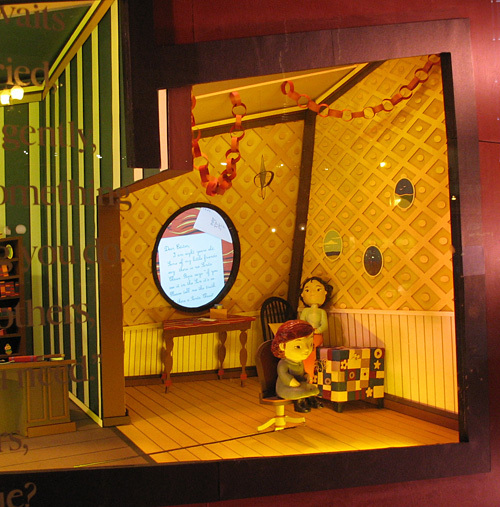 Again, a smaller window design when it comes to actual content, probably created to be as universal as possible to be used with other Macy's store dimensions nationwide. 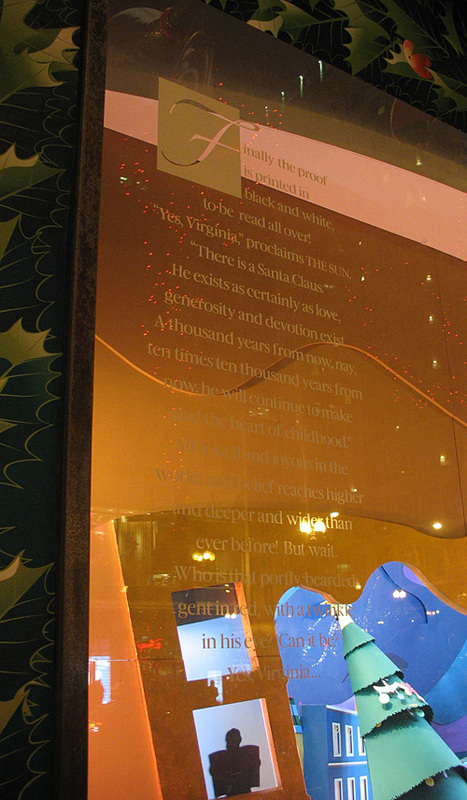 Also note the extremely hard to read text printed on the window itself. after book from all over the world. 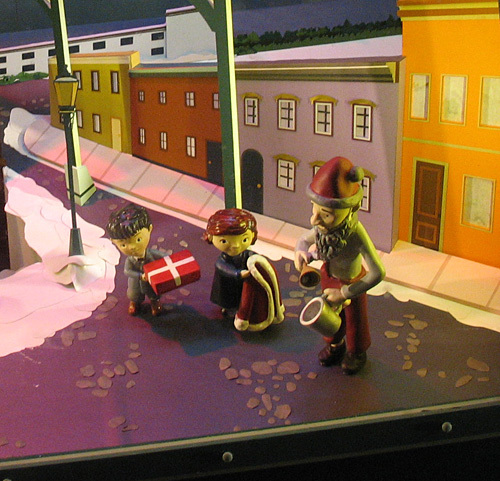 "In Holland, he's CINTER KLAS,"
Santa is beloved the world over. And yet… still no proof. Poor Virginia! "None of this tells me Santa is real." Who thought this border design was a good idea? Librarian's ladder is animated to move left/right. Broken on our visit. 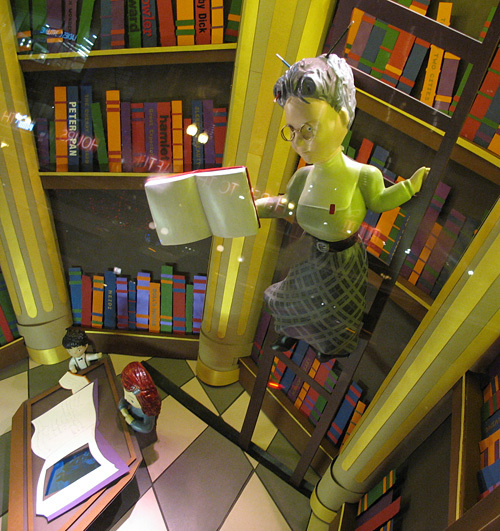 We're in the library now, with the librarian on a ladder that's motorized to move left and right. It was broken when we visited the windows. 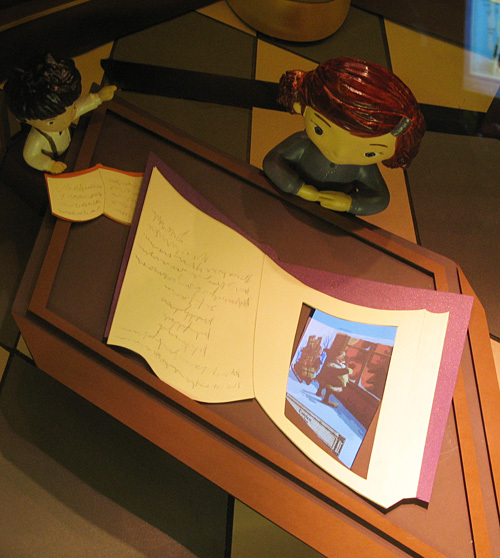 The book on the table also has a video screen embedded within displaying… something. 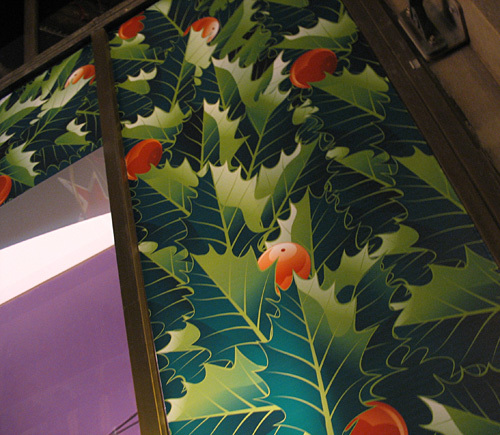 Take note of the "green branch" border used around the windows. Was this a clearance item from some 1970s garage sale? It doesn't tie in visually at all to the story being told, again is just filler, and even worse, changes orientation when moving from horizontal to vertical around the window. Virginia doesn't fall for Papa's logic. 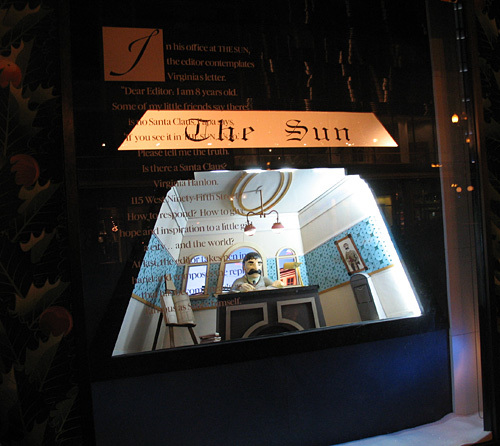 words: "If it's in THE SUN, it's so." the editor asking for the truth. you prove. It's something you do. hat's all proof you need." Why use the whole window when you can just use 25 percent? Virginia moves left/right on a track. Seriously, what's happening here? 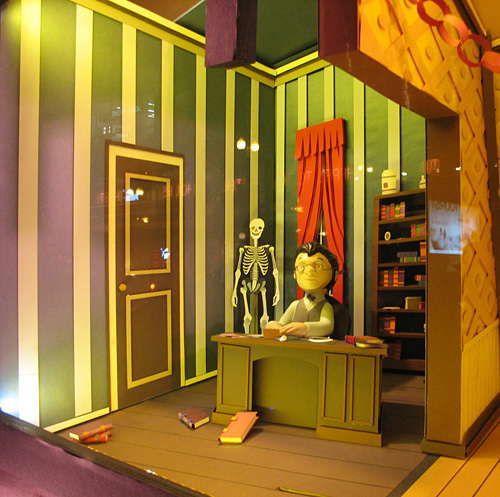 This window reminds me of the Thorne Miniature Rooms at the Art Institute. All that space in the window, but very tiny room itself. It was a bit challenging for kids to view when we were there, due to the limited access and somewhat elevated location off the ground. Again note how hard the text is to read on the window. 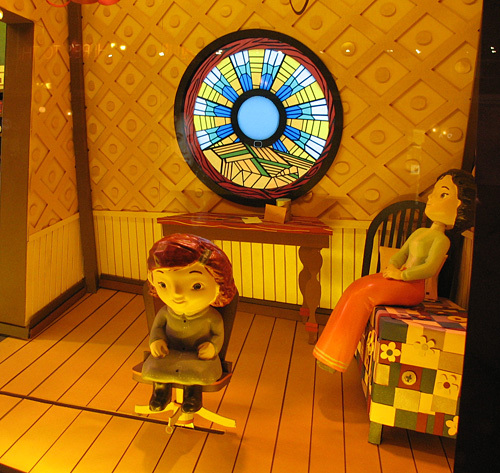 The chair in this window was motorized to shift between the office and bedroom. 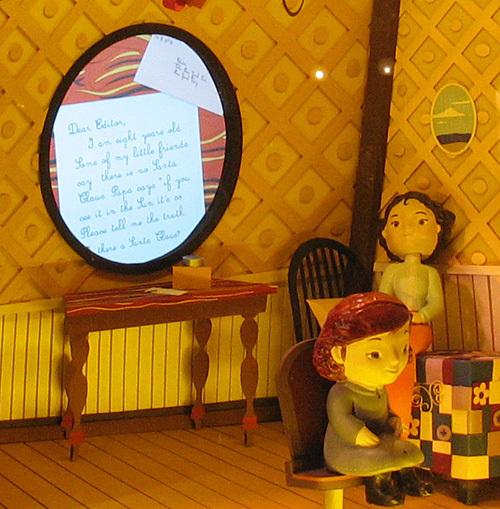 The window in the back of the bedroom was also a video screen that changed from a stained glass look to a close-up of Virginia's letter. Hey, it's another doorway to break up the action! a city… and the world? Hard to read text? Check. Defunct newspaper? Check. Guy just sitting there? Check. 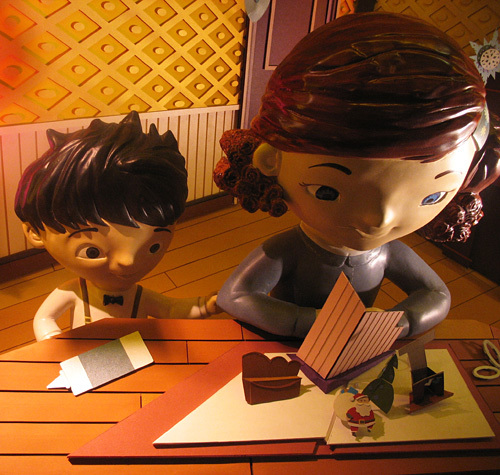 Viewing this, do you care if everyone was made out of paper or not? Half of the horizontal space in this window is blocked by the superimposed text… which you really can't read anyway. It's not like they didn't have other places to stick this text. For example, all that unused border area around each window. his coat to someone in need! "That is what makes Santa real, dear"
my piggy bank and got this for you!" "Yes you can," she insists. Here fake Santa, have a new coat! Animation for these scene? The shopper moving left and right. There's very little wonder or amazement. When we were checking out the window, kids quickly moved on. It's boring. 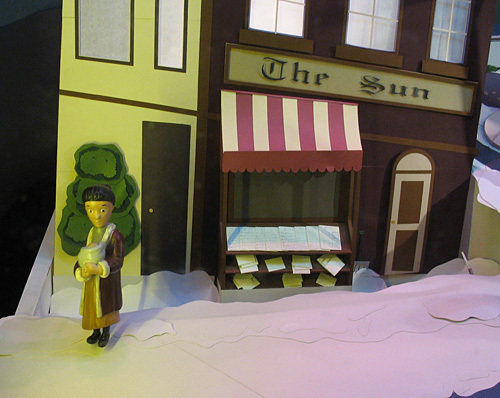 But hey, look at all those great paper buildings! Anyone have a dry erase marker for this closed doorway? Seriously, you did NOTHING to this space? Not even advertising? 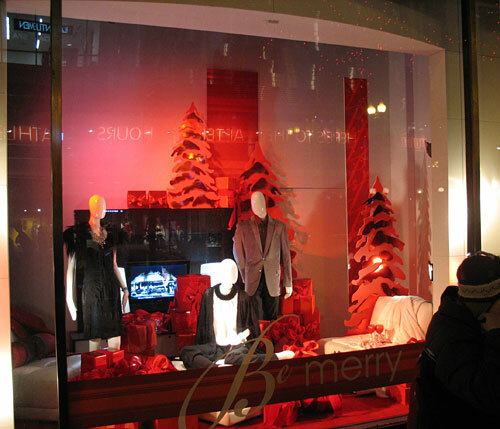 Is your visual merchandising team really that dense? to be read all over! "Yes, Virginia," proclaims THE SUN. "There is a Santa Claus. glad the heart of childhood." in his eye? Can it be? No one thought this was hard to read when then were creating it? Christmas tree almost destroys the town! 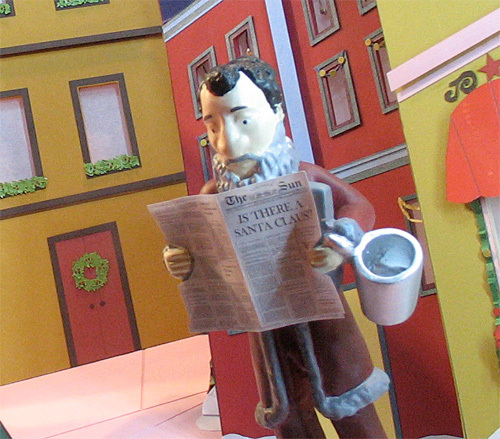 Hey, it's Christmas, let's read a paper! 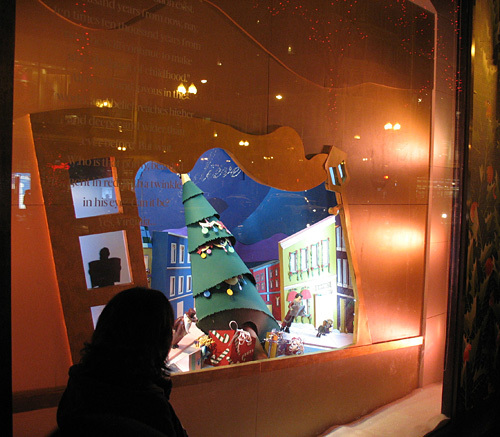 This is the final window in the Christmas window story. There's nothing quite like gold text superimposed over a gold background when it comes to readability! 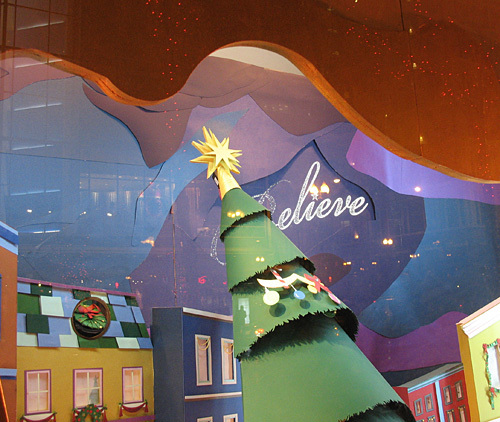 It does come complete with the "Believe" Macy's catchphrase written in the stars and a small R.H.Macy store in the landscape. And some guy reading a newspaper. But if you didn't have the captions for this story, could you really tell what was happening here? Beyond the bad photography (sorry! 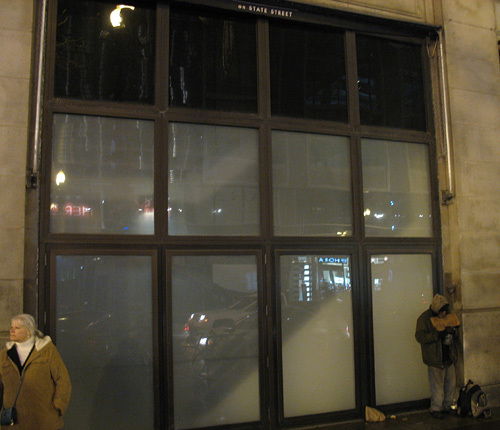 ), you can see another doorway off State Street. This one features an automatic door on the left side to make it freely accessible for those with disabilities. 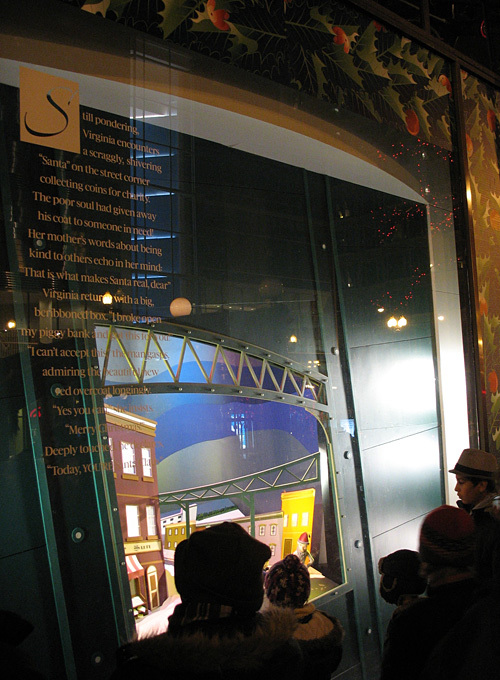 Historically, all the windows were used on State Street to tell a story. Not so in this case. 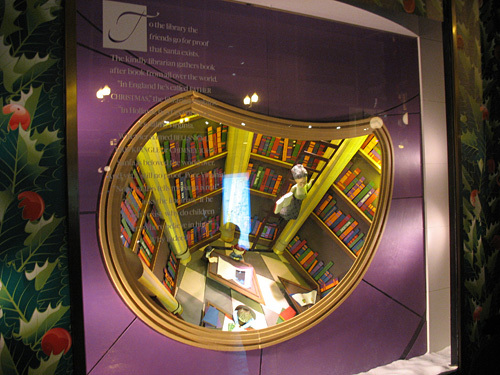 The final window reverts back to merchandise. You can see the reflection of Old Navy's "arrows" across the street. Perhaps you should shop there instead. 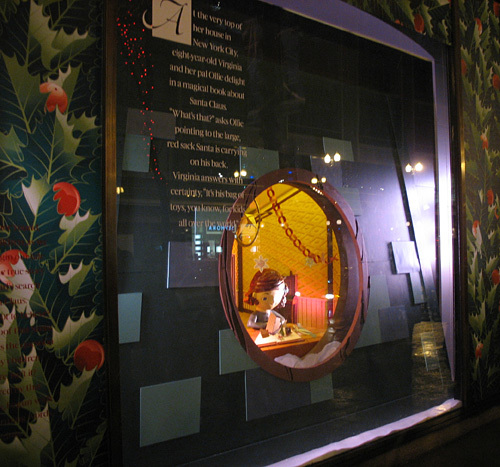 And with that, we wrap up our look at the Christmas windows on State Street. 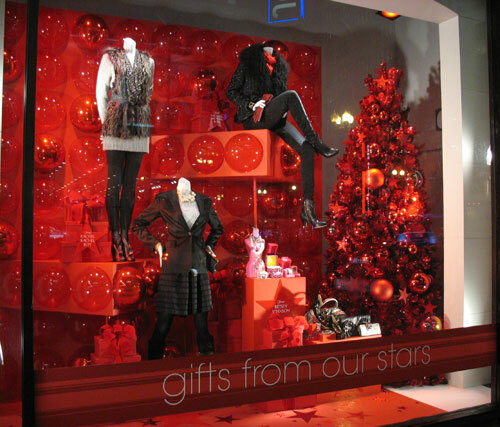 Probably the worst effort produced by Macy's to date. At least they are living up to their reputation! I agree with everything you wrote. These windows are so disappointingly bad. 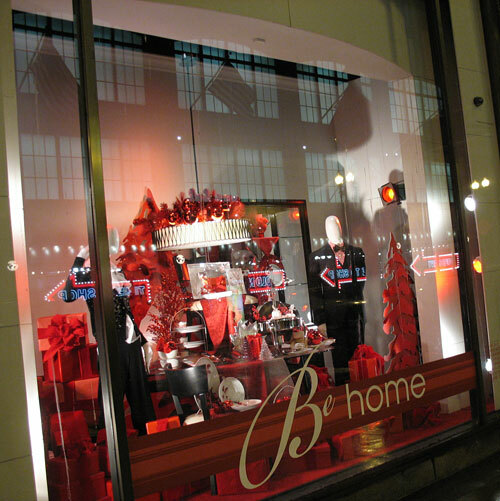 Plus, we know that the windows are nearly identical in all Macy's "Flagship" stores in other cities. It used to be that seeing the windows was an event. Now it's pointless. 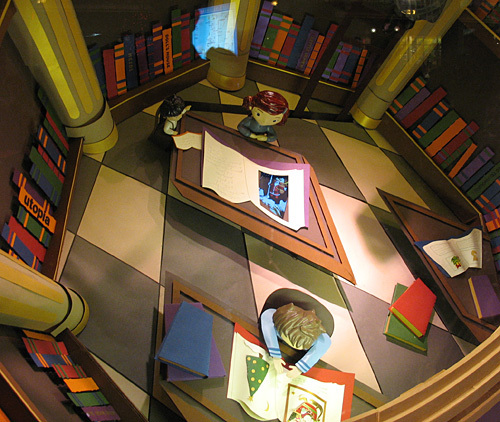 I bet if you lifted up the kid figurines in the displays it would read "Made In China" on the bottom.